I served this luxuriously saucy chicken over brown Basmati rice with roasted broccoli on the side; we ate the leftovers with sautéed spinach on the side. There was enough sauce to douse the veggies too- fabulous!! This recipe was adapted from The New York Times, contributed by Sam Sifton, adapted from Amandeep of Attica in Melbourne, Australia. I adapted the recipe by using boneless skinless chicken thighs. Dinner party worthy! In a large pan over medium heat, melt the butter in the oil until it starts to foam. Add the onions, and cook, stirring frequently, until translucent. Add the garlic, ginger and cumin seeds, and cook until the onions start to brown. Mmmm, so glad you included the link to the NY Times recipes for 2014! This chicken looks absolutely divine, so homey and saucey and buttery! Thank you for bringing to the party! Thank you so much, Selma!! This is a fabulous version of a delicious dish- please let me know if you give it a try! Thank you for hosting this big event this week! I love butter chicken and this looks so delicious! Thank you! I am now obsessed with butter chicken- at least this butter chicken!! Load up my plate, please! 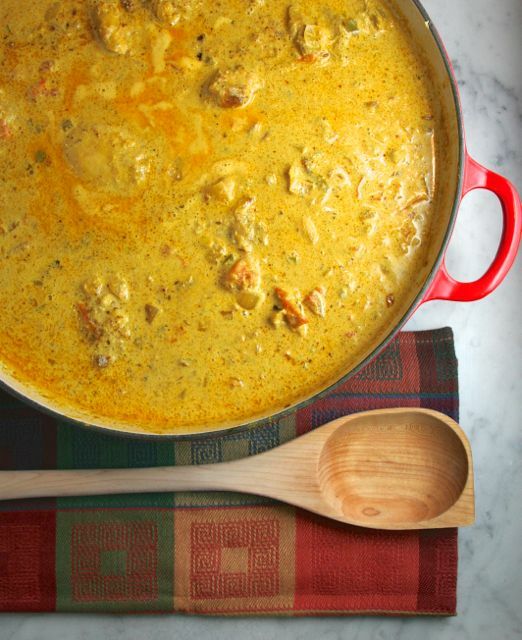 I love, love butter chicken and your recipe looks extraordinary!! Thank you, Julianna! I keep meaning to tell you that I made your Greek Red Lentil Soup- AGES ago- and LOVED it!! I’ll post it with a link maybe on my next snow day! (gave me some time to catch up & to bake!!) Happy FF! This looks wonderful, Josette! It sounds like it is seasoned to perfection… and I imagine the flavors (from the yogurt marinade to the spices) leave any lucky recipient wanting seconds or thirds. 😛 I think it’s high time I give Butter Chicken a try…I’m so glad you used the boneless, skinless thighs (they’re my favorite!). Thanks for sharing this pot of deliciousness with all of us partying at Angie’s for the Fiesta Friday Anniversary! Thanks, Nancy! You are the perfect hostess!! 🙂 We have another family favorite chicken that marinates in well seasoned FULL FAT Greek yogurt overnight- it’s hard to beat the end result! 🙂 Happy FF!! This looks and sounds so delicious! I definitely want to try it soon. Thanks for sharing it! I would just eat sauce if that was possible- so this was the PERFECT dish for me. 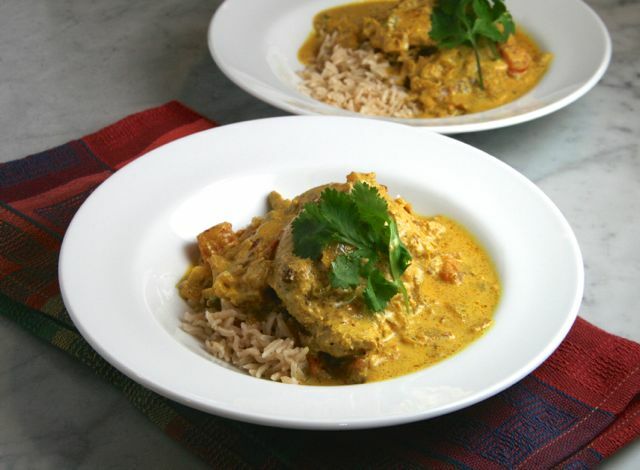 The chicken is just swimming in amazing, flavorful sauce! Let me know if you try it!! Thank you! 🙂 Try it!! I have to try this, I’ve heard of this before but never had, It really does sound incredibly delicious. Wow! I could just dive into that dish, Josette. 😀 This looks so good and I could almost smell it from here. Happy FF. You are too funny 🙂 Enjoy!! Made this today with a side of coconut rice and it was AMAZING! I have officially reached “Rock Star” status in my home with this dish!!!! Thanks so much for sharing this delicious recipe! My message to anyone reading this is MAKE THIS NOW!!! This dish can definitely feed a (lucky!) crowd!! (sorry for the delayed response 😦 ) Enjoy!!! Thank you- SO so SO good! !